Why Are Some Plants Overcompensating? Gardeners are all too familiar with herbivory. Countless times I have been awaiting a bloom to burst only to have the buds nipped off the night before they opened. While this can be devastating for many plant species (not to mention my sanity), for certain plant species, an encounter with a hungry herbivore may actually lead to an increase in reproductive fitness. Overcompensation theory is the idea that, under certain conditions, plants can respond to herbivore damage by producing more shoots, flowers, and seeds. It goes without saying that when this idea was originally proposed in the late 80's, it was met with its fair share of skepticism. Why would a plant capable of producing more shoots and flowers wait to be damaged to do so? The answer may lie in in the realm of biological trade-offs. Overcompensation may evolve in lineages that tend to grow in habitats where there is a "predictable" amount of herbivory in any given growing season, perhaps a region where large herbivores migrate through annually. Plants in these habitats may conserve dormant growing tips and valuable resources to be used once herbivory has occurred. Perhaps this also serves as a cue to upregulate antiherbivory compounds in new tissues. The trade-off is that the plants incur a cost in the form of fewer flowers and thus reduced reproduction when herbivory is low or absent. It could also be that plants are exhibiting two different strategies - one to deal with competition and one to deal with herbivory. If herbivory is low, plants may become more competitive, thus favoring rapid vertical growth of one or a couple shoots. When herbivory is high, rapid vertical growth becomes disadventageous and overcompensatory branching and flowering can provide the higher fitness benefits. These possibilities are not mutually exclusive. In fact, since the late 80's, experts now believe that overcompensation is not an "either/or" phenomenon but rather a spectrum of possibilities that are dictated by the conditions in which the plants are growing. Certainly overcompensation exists but which conditions favor it and which do not? 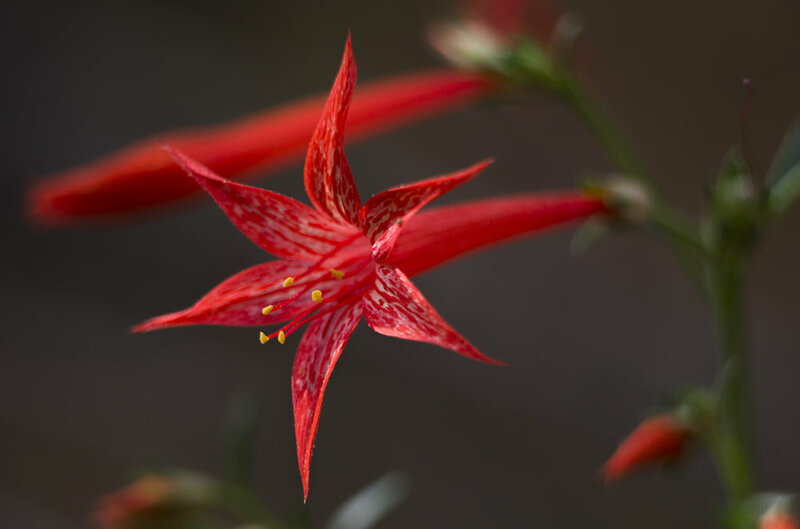 Research on scarlet gilia (Ipomopsis aggregata), a biennial native to western North America, suggests that overcompensation comes into play only when environmental conditions are most favorable. Soil nutrients seem to play a role in how well a plant can bounce back following herbivore damage. When resources are high, the results can be quite astounding. Early work on this species showed that under proper conditions, plants that were browsed by upwards of 95% produced 2.4 times as much seed as uneaten control plants. What's more, the resulting seedlings were twice as likely to survive than their uneaten counterparts. Things change for scarlet gilia growing in poor conditions. Low resource availability appears to place limits on how much any given plant may respond to browsing. Also, herbivory can really hamper flowering time. Because scarlet gilia is pollen limited, anything that can cause a disruption in pollinator visits can have serious consequences for seed set. 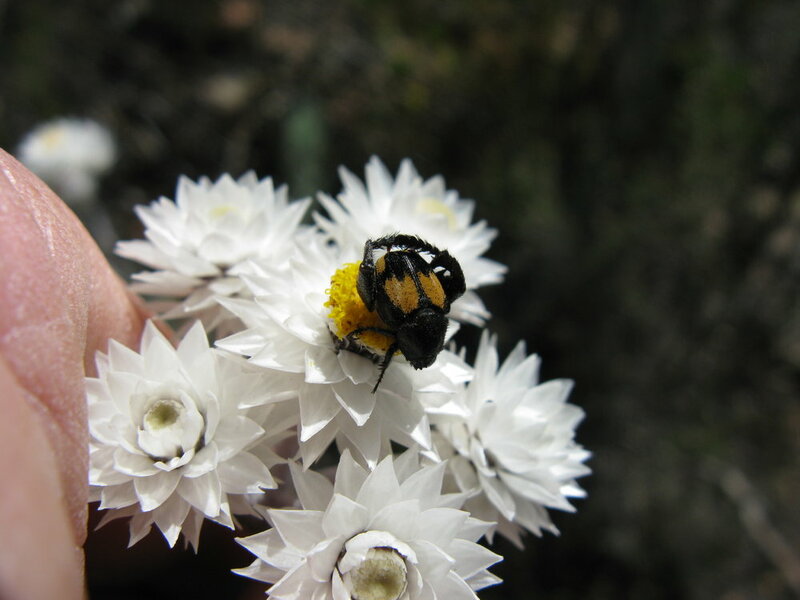 In at least one study, browsed plants flowered later and received fewer pollinator visits as a result. More recent work has been able to add more nuance to the overcompensation story. For instance, experiments done on two subspecies of field gentian (Gentianella campestris), add further support to the idea that overcompensation is a matter of trade-offs. They showed that, whereas competition with neighboring plants alone could not explain the benefits of overcompensation, browsing certainly can. Plants growing in environments where herbivory was higher overcompensated by producing more branching, more flowers, and thus more seed, all despite soil nutrients. It appears that herbivory is the strongest predictor of overcompensation for this gentian. What's more, when these data were fed into population models, only the plants that responded to herbivory by overcompensation were predicted to show any sort of population growth in the long term. Despite all of the interest overcompensation has recieved in the botanical literature, we are only just beginning to understand the biological mechanisms that make it possible. For starters, we know that when a dominant shoot or stem gets damaged or removed, it causes a reduction in the amount of the plant hormone auxin being produced. When auxin is removed, tiny auxiliary buds at the base of the plant are able to break dormancy and begin growing. Removal of the dominant shoot or stem can also have major impact on the number of chromosomes present in regrowing tissues. Work on Arabidopsis thaliana revealed that when the apical meristem (main growing tip of a vertical stem) was removed, the plant underwent a process called "endoreduplication" in which the cells of the growing tissues actually duplicate their entire genome without undergoing mitosis. Endoreduplication is a complex process with lots of biological significance but in plants it is often associated with stress responses. By duplicating the genomes of these new cells, the plants may be able to adjust more rapidly to their environment. This often manifests in changes to leaf size and shape and an uptick in plant defenses. Thus, plants may be able to fine tune the development of new tissues to overcompensate for browsing. Certainly far more work is needed to understand these mechanisms and their functions in more detail. Overcompensation is not universal. Nonetheless, it is expected to occur in certain plants, especially those with short life cycles, and under certain environmental conditions, mainly when herbivore pressure and nutrient availability are relatively high. That being said, we still have plenty more to learn about this spectrum of strategies. When does it occur and when does it not? How common is it? What are the biological underpinnings of plants capable of overcompensation? Are some lineages more prone to overcompensation than others? Only more research can say for sure! I love walking around my town at night. Things really seem to slow down when the sun sets. Growing up in the country, my evening walks were lit only by the moon. Now that I live in civilization, however, street lights punctuate the darkness on every block. Walking around I can't help but wonder what all of this artificial light is doing to our photosynthetic neighbors. The vast majority of plants need light to make food. It doesn't matter if this light comes from the sun or a high powered electric light, as long as it is strong enough for photosynthesis. Even weaker wavelengths of light serve a purpose for our botanical friends. Plants can sense the relative length of uninterrupted darkness in their environment and they use that information for myriad internal processes. Its this dependence on light that makes many plant species vulnerable to our addiction to artificial lighting. Just because a light isn't strong enough for photosynthesis doesn't mean it isn't affecting nearby plants. This is especially true for plants that use day length for timing events like bud break, flowering, and dormancy. The type of lighting favored by most municipalities emit wavelengths that peak especially high in the red to far-red ratio of the electromagnetic spectrum, which makes them particularly adept at disrupting plant photoperiods. One of the most obvious effects of artificial lighting on plants can readily be seen in street trees growing in temperate regions. Though light sensitivity varies from species to species, trees growing near street lights tend to hold onto their leaves much longer in the fall than trees farther away. Because artificial lighting is enough to trick the red to far-red receptors in plants, it can "convince" trees that the days are longer than they actually are. Additional photosynthesis may not seem that bad but holding onto leaves longer makes trees more susceptible to ice damage. The effects of artificial lighting continues into spring as well. Trees growing near lights tend to break buds and flower earlier in the spring. This too makes them susceptible to frost damage. Early flowering plants run the risk of losing their entire reproductive effort by blooming before the threat of frost is gone. This can really mess up their relationship with pollinators. The effects of artificial lighting can even influence the way in which plants grow. 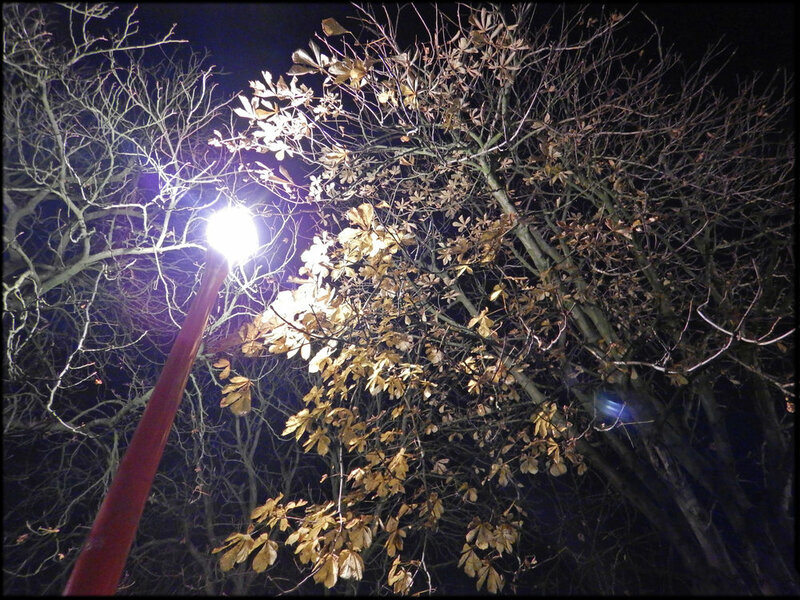 Research has found that plants growing near street lights had larger leaves with more stomatal pores and these pores remained open for considerably longer than plants growing under unlit night conditions. This made them more susceptible to pollution and drought, two stressors that are all too common in urban environments. This issues is made much worse if the artificial lighting never turns off throughout the night. Artificial lighting affects more than just plant physiology too. Scaling up, the effects of night lights can have whole ecosystem consequences. For instance, researchers found that artificial lighting was enough to change the entire composition of grassland communities. Some plants responded well to artificial lights, producing more biomass and vegetative offshoots to the point that they pushed out other species. This was compounded by the change in reproductive output, with certain species showing higher seed production than others. Changes in plant physiology, phenology, and composition also affect myriad other organisms in the environment. Changes in the timing of flowering or bud break can disrupt things like insects and birds that rely on these events for food and shelter. Research even suggests that forest regeneration is being altered by artificial lighting. Seed dispersers such as bats often will not fly into well-lit areas at night, therefore reducing the amount of seeds falling in those areas. Such research is still in its infancy meaning we have a lot more to learn about how artificial lighting is disrupting natural events. Light pollution is so much more than an aesthetic issue. Artificial lighting is clearly having pronounced effects on plant life. Disrupt plants and you disrupt life as we know it. Certainly more work is needed to tease out all the ways in which lights influence plants, however, it is clear that we must work hard on reducing light pollution around the globe. Common names are a funny thing. Depending on the region, the use, and the culture, one plant can take on many names. In other situations, many different plants can take on a single name. Though it isn't always obvious to those unfamiliar with them, the use of scientific names alleviates these issues by standardizing the naming of things so that anyone, regardless of where they are, knows what they are referring to. That being said, sometimes common names can be entertaining. Take for instance, plants in the genus Syncarpha. These stunning members of the family Asteraceae are endemic to the fynbos region of the Eastern and Western Cape of South Africa. In appearance they are impossible to miss. In growth habit they have been described as "woody shrublets," forming dense clusters of woody stems covered in a coat of woolly hairs. Sitting atop their meter-high stems are the flower heads. Each flower head consists of rings of colorful paper-like bracts surrounding a dense cluster of disk flowers. The flowering period of the various species can last for weeks and spans from October, well into January. Numerous beetles can be observed visiting the flowers and often times mating as they feed on pollen. Some of the beetles can be hard to spot as they camouflage quite well atop the central disk. Some authors feel that such beetles are the main pollinators for many species within this genus. Their mesmerizing floral displays are where their English common name of "everlasting" comes from. Due to the fact that they maintain their shape and color for a long time after being cut and dried, various Syncarpha species have been used quite a bit in the cut flower industry. A name that suggests everlasting longevity stands in stark contrast to their other common name. These plants are referred to as "sewejaartjie" in Afrikaans, which roughly translates to "seven years little." Why would these plants be referred to as everlasting by some and relatively ephemeral by others? It turns out, sewejaartjie is a name that has more to do with their ecology than it does their use in the floral industry. As a whole, the 29 described species of Syncarpha are considered fire ephemerals. The fynbos is known for its fire regime and the plants that call this region home have evolved in response to this fact. Syncarpha are no exception. They flower regularly and produce copious amounts of seed but rarely live for more than 7 years after germination. Also, they do not compete well with any vegetation that is capable of shading them out. Instead, Syncarpha invest heavily in seed banking. Seeds can lie dormant in the soil for many years until fires clear the landscape of competing vegetation and release valuable nutrients into the soil. Only then will the seeds germinate. As such, the mature plants don't bother trying to survive intense ground fires. They burn up along with their neighbors, leaving plenty of seed to usher in the next generation. Research has shown that its not the heat so much as the smoke that breaks seed dormancy in these plants. In fact, numerous experiments using liquid smoke have demonstrated that the seeds are likely triggered by some bio-active chemical within the smoke itself. So, there you have it. Roughly 29 plants with two common names, each referring back to an interesting aspect of the biology of these plants. Despite their familiarity and relative ease of committing to memory, the common names of various species only get us so far. That's not to say we should abolish the use of common names altogether. Learning about any plant should be an all encompassing endeavor provided you know which plant you are referring to. When we think about plants, swimming ability generally doesn't come to mind. As kids we learn that one of the major differences between plants and animals is that plants generally can't move on their own volition. Certainly there are exceptions to this rule - sensitive plants and Venus flytraps to name a few. However, there are plants out there in which swimming is a crucial component of their life cycle. Though it isn't the plant itself that does the swimming, some of the ancestral plant lineages alive today have motile sperm! Swimming sperm is a throwback to the early days of plant evolution. Because they arose from aquatic algae, a sperm's ability to swim to an ovule helped increase the chances of reproduction. Today we see this adaptation in plants like liverworts, mosses, and ferns, which still require water to complete their life cycle. However, swimming sperm are not restricted to the cryptograms. This adaptation also can be found in cycads (as well as ginkgoes). Their sperm are super strange too. They look like little seeds covered in concentric rings of beating flagella. Unlike cryptograms, however, their swimming ability doesn't come into play until pollen comes into contact with the ovule. Cycads are either male or female. Each produces cone-like structures called strobili. This is where the magic happens. When pollen from a male plant finds its way onto the ovule of a female, it does something quite strange. It fuses with the ovule and begins to grow. In essence it acts almost like a parasite, sucking up nutrients from the ovule tissue and destroying it in the process. This is okay because once this happens, these tissues soon become obsolete. What matters is the female gametophyte, which is embedded inside the ovule. The pollen begins to grow a tube down into the ovule. Once it has gained enough energy, the pollen will then burst and release its sperm. This is where the flagella come in. Each sperm is like a tiny submarine, capable of swimming around inside the ovule until it locates the female gametophyte. Then and only then is fertilization accomplished. Pretty wild for an otherwise sessile organism, wouldn't you say?